Jacob Hristianopoulos (15) with coach Lee Derby. 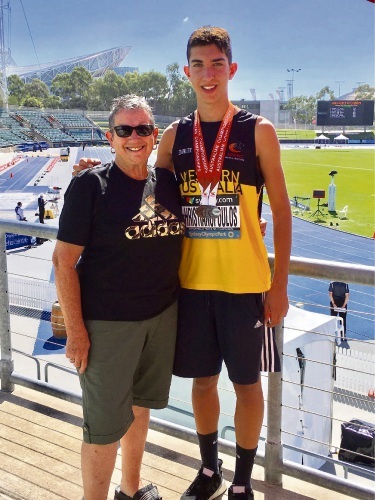 BALCATTA teenager Jacob Hristianopoulos has returned from the Australian Athletics Championships a dual medal winner. The 15-year-old won silver in the under-18 100m relay and bronze in the under-17 100m hurdles at the championships, held in Sydney from April 1 to 7. Jacob finished fourth in the long jump event, missing out on bronze by 1cm. He has also been selected as a WAFL boundary umpire this season.